President Donald Trump said the idea that Supreme Court nominee Brett Kavanaugh would withdraw from his confirmation process was "ridiculous" on Monday, praising his character and intellect. Kavanaugh has repeatedly denied an accusation that he sexually assaulted Christine Blasey Ford when they were both teenagers at a Maryland house party in the early 1980s. Ford said a heavily intoxicated Kavanaugh forced her onto a bed, tried to remove her clothes, and held his hand over her mouth before she managed to escape. At the White House, Trump called Kavanaugh "one of the finest people that I've ever known." "He's an outstanding intellect, an outstanding judge, respected by everybody," Trump said. "Never had even a little blemish on his record." Senate Democrats have called for an investigation and a delay of the Senate Judiciary Committee vote on Kavanaugh, scheduled for Thursday. Democratic Sen. Dianne Feinstein (Calif.) received Ford's accusation in a letter in July—she said she wished to remain anonymous—but did not bring up the charge during confirmation hearings. The letter's contents eventually leaked and Ford identified herself to the Washington Post as the accuser. Trump didn't mention the accusation or the accuser, but he said he wished Democrats hadn't waited until the last minute to come forward with the charge from Ford. He also said Feinstein should have brought it up with Kavanaugh in their one-on-one meeting. He said he had faith in the U.S. Senate going through a "process" and making sure to "hear everybody out." "I'd like to see a complete process," he said. "Most importantly, I want the American people to be happy … If it takes a little delay, it'll take a little delay." He also said he hadn't spoken with Kavanaugh since the accusation became public. 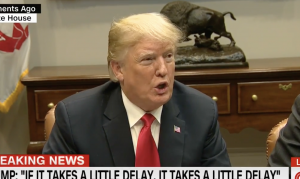 One reporter asked Trump if Kavanaugh had offered to withdraw his name. "Next question. What a ridiculous question that is," he said. Trump nominated Kavanaugh in July to replace retiring Justice Anthony Kennedy.